Leo Delibes' COPPÉLIA is pure delight, a feast of musicality and humor for all ages. Probably the greatest ballet comedy ever written! 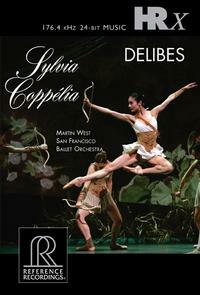 On this disc we also present Delibes' SYLVIA, a romance filled with sighs of longing and the thrill of infatuation. Set in antiquity, the ballet literally places love on a pedestal in the person of the Greek god Eros. Like many popular compositions, Delibes' works, including pieces of these ballets, have repeatedly been used in films dating back to the earliest talkies. His music is also a favorite of cartoon series "Ren and Stimpy" and "The Simpsons." The San Francisco Ballet, the oldest professional ballet company in America, was also one of the first dance companies to have its own permanent body of musicians. By the 1990s the San Francisco Ballet Orchestra was generally regarded as one of the finest ballet orchestras in the world. Notably, in 1995, the Orchestra accompanied 12 international dance companies, as well as San Francisco Ballet, during the ambitious, weeklong United We Dance Festival, which promoted international communication and understanding. CONDUCTOR MARTIN WEST is acknowledged as one of the foremost conductors of ballet, garnering critical acclaim throughout the world. West conducted the English National Ballet starting in fall 1997 until 2007. He has worked with many of the top companies in North America, such as New York City Ballet, Houston Ballet and the National Ballet of Canada. In fall 2005, West was appointed music director & principal conductor for the San Francisco Ballet Orchestra. Founded in San Francisco in 1976, Reference Recordings believes that how a recording sounds is as important as the music itself. RR thanks everyone who was instrumental in bringing this outstanding album to life including Conductor: Martin West; Producers: Victor and Marina Ledin (Multi-Grammy Nominations for Producer of the Year, Classical); Engineer: "Prof." Keith O. Johnson (Grammy award-winning engineer, inventor and entertainment technologist) and very special thanks to all the Sponsors of the San Francisco Ballet Orchestra without whom this recording could not have been made.